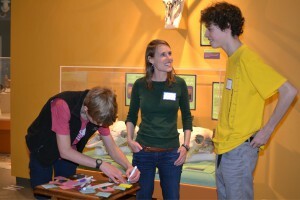 Alex Rose discusses the importance of diversifying experiences, enthusiasm, communication and Citizen Science and how they tie into her role with the Science Discovery Teen Café. Alex has a diverse background in science education, communication, and outreach. 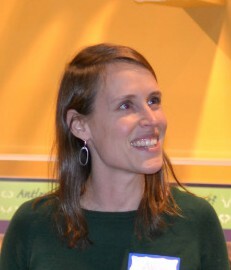 She is currently working with CU Science Discovery and the CU Museum of Natural History to develop Citizen Science research projects and programming. In addition to loving wildlife in the outdoors, she and her husband share their home with caged birds, a dog, and an elderly house rabbit. In her free time, Alex loves playing tennis, hiking, cross-country skiing, and knitting. 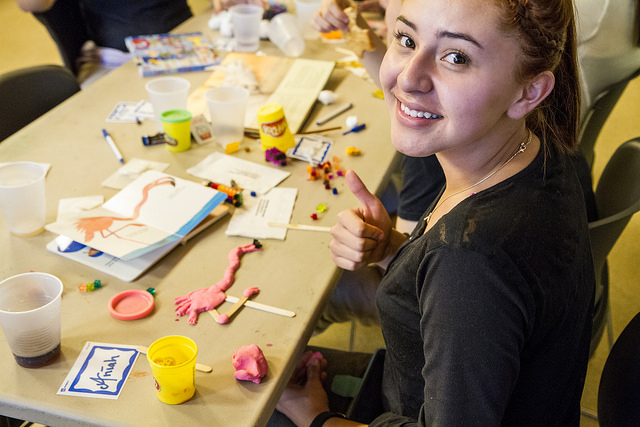 Our Teen Café has two homes; one in Boulder and one in Denver, Colorado. In Boulder, our Café’s home is the BioLounge at the University of Colorado Museum of Natural History. In Denver, our Cafés are held at the Denver Botanic Gardens. We also try to coordinate at least one lab tour or off-site experience each semester. I think what’s most special – although not necessarily unique – about our Café is that we can feature the diversity of research being done across the CU campuses and in our region more broadly. This means that our topics are all over the place, ranging from computer engineering in music to the study of tornadoes. Two participants in the café “The Architecture of Music” show off the musical score to their multimedia presentation on life in high school. I have a PhD in Ecology and Evolutionary Biology, but have always been interested in outreach and education, particularly via science communication. I had a fellowship in Informal Learning in Schools during graduate school, and I’ve worked a lot in the field of citizen science. I feel passionately that scientists should all be able to be able to effectively communicate their research to a lay audience. I went to a small high school in a small town in rural Virginia, and I had little exposure to anything beyond the basic sciences—Biology and Chemistry, basically. I didn’t even want to study science in college because I didn’t know what you could do with it besides becoming a doctor or a high school teacher. College blew my mind! So I come to the job as Café coordinator with the sincere wish that students in high school get exposed to a diversity of areas of expertise. My hope is that they realize sooner, rather than later, that there are so many ways to be a scientist, and that vastly different skill sets and talents are required for every field. Your program has a home with Science Discovery at the University of Colorado Boulder . . . how do you see it fitting with their mission? I think our partnership with CU is really a very productive one. On the one hand, we get to recruit presenters who are on the cutting edge of their fields, and who do such an exciting diversity of work. We frequently engage graduate students as well as full faculty, so that our teens get a sense of the whole academic and professional trajectory in science. On the other hand, presenters at our Cafés have a unique opportunity to impress and recruit potential CU students. I don’t think many professors get a chance talk with high school students about what they should do to prepare for a career in a particular field or why CU would be a great place for a student with an interest in that field. Getting the word out about our Cafés and recruiting a diverse audience has been really challenging. We’ve been really successful at recruiting students from one high school in particular in our area, mostly thanks to some committed Teen Leaders. But expanding beyond that high school in any significant way has been slow. We now have a very enthusiastic core group of attendees in both of our locations, but we know there are so many more students that we haven’t yet reached. Especially in Denver, where we have fewer connections with local teachers and where other local institutions like the Denver Zoo and the Museum of Nature and Science have large teen programs, it has been really hard to figure out how to spread the word about our program. It feels like my favorite Cafés are always the ones we just did. But, I really was so proud of our last two Café programs, and both for the same reason—they were just the right blend of interactive and informative. Our most recent Café featured Dr. Liz Specht of CU’s Biofrontiers Institute, speaking about her work engineering algae and other unicellular organisms to do all sorts of science fiction type things. The Boulder Café speaker before that was a PhD student in Geology, Laura Grace Beckerman, who indirectly studies environments on Mars by looking at extreme environments on Earth that may be analogous to those found on Mars. Both speakers did a great job making their work accessible to the students, giving them a really good sense of what it’s actually like to do research in their fields, and they both found a great balance between presenting information and engaging the students throughout the evening. Both Cafés featured interactive activities. For the Martian geology presentation, the activity actually happened before the talk, and then Laura Grace kept referring to the results throughout her talk. This was a creative and fun way to keep the students paying attention—they already had some connection with the material before she even started her talk. 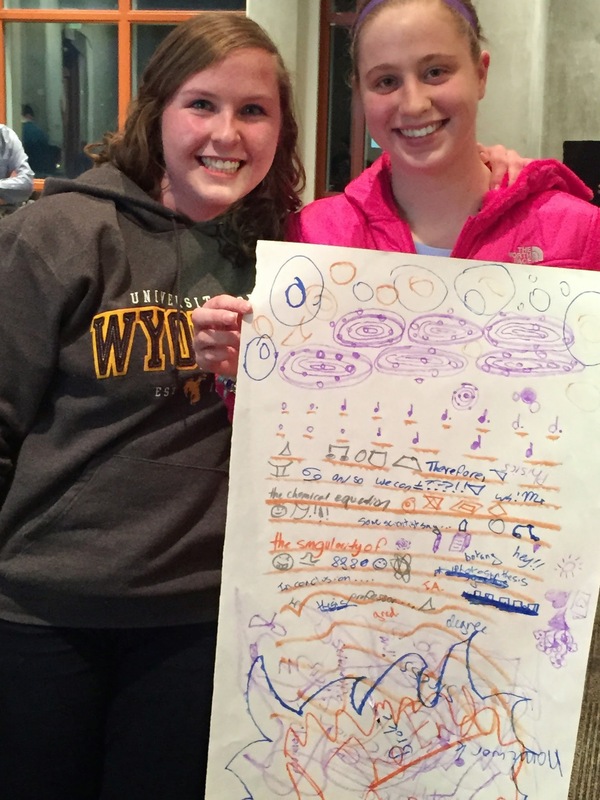 For the Biotechnology Café, Liz and I designed a pretty elaborate series of problem solving games that required students to engineer DNA sequences to solve different puzzles. The proteins they were engineering were “encoded” on DNA fragments made of different colored card stock. It’s a little hard to explain, but it really worked well and the students loved the challenge/puzzle aspect of the activity. In the last 6 months or so our Teen Leadership Team has really flourished. It’s been so much fun to see their enthusiasm and creativity for the Cafés develop. Something we do with them that’s particularly fun is we have them interview the speaker via Skype ahead of the Cafés. This way, the teens get the information they need to introduce the speaker at the Café and the speaker gets to tell them a bit about their work, what they plan to talk about, and to get some feedback. Several times these Skype chats have led to a drastic revision of what the speaker plans to discuss, and most of the time the teens have great ideas about how to link an activity to the presentation. So I think my favorite part of our Café program is sharing the enthusiasm of our teens for different kinds of science, and observing their pride in the roles that they play as both leaders and as audience members. And, honestly, I also really love learning alongside of them! Thank you so much for you time, Alex. We appreciate your input, your experiences, and your great photos!